time over at Whimsy Haven! Ok, you done....can you stand it? ok, so do you want the Birthday Star set? Cuz Linds is giving one away today! and NOT color to save me time. This is made with the new Birthday Star set. Misc: Ribbon, polka dot impression plate from PTI, dimensionals. Make sure to head on over to the Whimsy Blog today! this is fabulous! i love the simplicity and you can never go wrong with black & white! totally fabulous! Cool card - looks great in black and white! Love the classic b&w look!!! CUTE ♥ the Black & White. Love this classy look Julie...great idea! The black and white is FABULOUS! I love what you did with this set!! Beautiful and classy... I love that is is black and white.. great for both male and female. Love this black and white Julie! So pretty!! The black bow is divine! Lovely sophisticated card! Beautiful Julie! 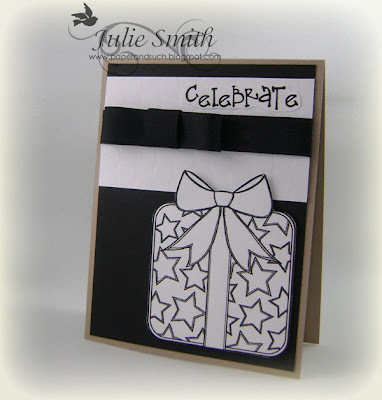 I love the black and white and your ribbon treatment! Oh I love this Julie and love the black and white!!!! Love it! Love the black and white!